Once upon a time, visiting a brewery or bar was the only way to get a taste of craft beers that weren’t bottled or canned. Then, early last February, the Vermont Department of Liquor Control changed a regulation to allow liquor stores and retail outlets to join breweries in offering growlers of fresh beer. The first retailer to spring into action was Burlington’s Pearl Street Beverage. The staff hustled to move shelves from the front of the store to install a bar and tap equipment. “I had been following [the regulation] pretty closely, and we wanted to be up and running before everybody else,” says John Dubie, PSB’s owner. 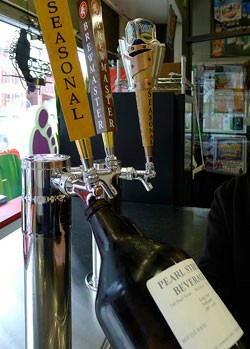 PSB purchased a self-contained keg cooler that holds four kegs, as well as a bar and the growlers, themselves. “We invested quite a bit,” says manager Chris Reilly, intimating the store’s staff knew how successful the new option would be. PSB kicked it off on March 23 with chilled 64-ounce growlers of Long Trail Triple Bag, a rarely brewed beer that is usually only available in kegs. That first weekend, the store sold 100 growlers of Triple Bag for $10.99 each. “We’ve been concentrating on craft beers that you can’t necessarily get in the bottle or are very hard to find,” says Dubie. Long Trail Pollenator and Long Trail Coffee Stout, as well as special releases from Brooklyn Brewery and others, are next in the lineup. According to Dubie, one of the most common questions the store’s staff received from early growler customers was, “When are you going to have Switchback?” The answer: not any time soon. Switchback Brewing Company owner William Cherry has decided not to offer his beer to retail outlets that fill growlers.